A few days ago a reader posed several questions, each of which is worthy of a blog entry. I will answer them one question at a time. Here is question #1: "What are your earliest memories of the island?" As many of our readers know, my father, Lawton Howard (1911-2002), left Ocracoke when he was 16 years old, and, like most young island men of that era, moved to Philadelphia to work. There he met and married my mother. Every summer we came back "home" to Ocracoke. My earliest memories include taking the 4 hour trip across Pamlico Sound on the mailboat Aleta. This was, of course, before there was any ferry service to the island. You can only imagine the excitement and anticipation of this genuine adventure. In those early days Ocracoke had only one single-lane paved, concrete, road. It ran from the old Navy base (where the NPS Visitors Center is located today), turned where the Anchorage Inn is now, turned again before the road to the British Cemetery, turned again at the present-day Coffee Co., then "T"ed at the end, and terminated in short aprons where the Navy dumped spent ammunition (hence the local name for the final, long section of the road, "Ammunition Dump Road"). The rest of the village lanes and paths were mostly deep, soft sand. I loved to run barefoot all over the village. When I was a teenager my friends and I wandered around the village until late at night. When I came back home my feet were filfthy. Too tired to wash my feet before climbing into bed, I'd simply pull on my socks...then wash in the morning. Every Saturday night we had square dances. In my days they were held in the school recreation hall (one of the abandoned WWII buildings that was moved to the school property -- where the gymnasium is today; the building was moved again in the 1970s, and is now Jimmy's Buffet restaurant). Oh what fun we had at those dances! Everyone was there...spirits were high...Ocracoke girls were cute...and there was always homemade meal wine somewhere. In those days there were still numerous skeletons of wrecked schooners and other sailing vessels that had been tossed upon the beach. When I was a child I loved to climb on them and imagine the sailors and pirates who played such a prominent role in Ocracoke's history. Of course, in the evenings visiting my grandparents, aunts, uncles, and cousins was an important part of island life. The older folks told so many stories, and laughed so easily. During the day I'd wander down to the docks and watch the boats bring in fish, turtles, and other seafood. The old men sat on benches with white sailor's caps, barefooted with their pants rolled up, smoking cigarettes, drinking Pepsi Colas, and carving small birds. Sometimes at night my buddies and I would wade out into the sound with our Coleman lanterns and flounder gigs. What a wonderful feeling it was to return home late at night, exhausted, carrying a mess of fresh flounder for our next day's dinner. Horses, of course, made a visit to Ocracoke even more exciting. Before the mid 1950s the semi-wild ponies often found their way into the village. We'd see them around the harbor, or walking down Howard Street. My mother always filled a large galvanized tub so they'd have something to quench their thirst in the hot summer months. My Uncle Marvin was the leader of the mounted Boy Scout troop, so he always had a horse nearby. Another scout leader once sent him an Indian headdress. I can still see him riding through the village with that headdress, having a grand old time. Well, there you have a few of my early memories of Ocracoke. I can't think of a better way to to have spent a childhood summer! Our latest Ocracoke Newsletter is a list of traditional island remedied. You can read it here: http://www.villagecraftsmen.com/news.htm. If you've been to Ocracoke you probably know that there are many cats on the island. We also have quite a few dogs, but half a century ago dogs were rare on Ocracoke. I remember my Aunt Tressie expressing her fear and concern when we brought our dog, Ginger, to the island. Aunt Tressie, like most islanders had free-range chickens, and she was worried that Ginger would chase and kill them. Keep in mind that most people's food came from the sound, their gardens, and their chickens. They could not afford to lose their primary source of meat...so few people had dogs. In 1955 Ruth & Latrobe Carroll, from Asheville, NC, wrote and illustrated a wonderful book about Ocracoke. Digby the Only Dog begins, "Once there was an island. And on that island there were ponies and cattle and ducks and chickens and geese and people and many many many cats. But there was only one dog. His name was Digby." The illustrations show Howard Street, the docks, mailboat, Methodist church, schoolhouse, lighthouse, and various homes. Unfortunately, Digby is out of print. But here are photos of the front and back covers. Maybe you will find a copy one day at a yard sale. If so, buy it and treasure it. You won't be disappointed. 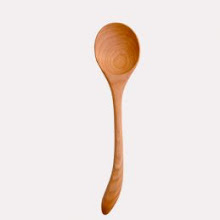 Our latest Ocracoke Newsletter is a list of traditional island remedies. You can read it here: http://www.villagecraftsmen.com/news032111.htm. I received a letter from Merle Davis recently, with an update on our post from Thursday, March 3. Not only will Donald Davis be signing his latest book, Tales From a Free-Range Childhood, at Ocracoke's "Books to be Red" from 4:00 to 5:30 on April 1 (Merle says, "no fooling"), but at 7:00 pm that same day Donald will be giving a benefit storytelling performance at Deepwater Theater. This will be a fund raiser for the Ocracoke Preservation Society. 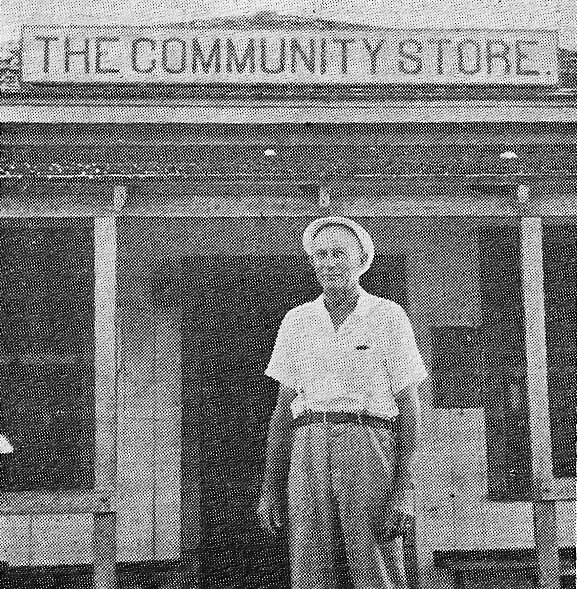 Merle says, "Ocracoke Preservation Society is our community memory and our story container." As with so many non-profit organizations, OPS has been forced to make cuts and shifts in funds because of difficult economic times. Plans are being made to generate the needed funds to continue with OPS's mission. However, more needs to be done. Donald's performance is a generous donation of his time and talent. There will be no admission cost. Donald and Merle hope you will come and bring your tax-deductible contribution to the Preservation Society. If you cannot come on April 1 but wish to help, you can contribute on line by clicking here: http://catalog.opsmuseum.org/browseGroup.cfm?item_group_id=89843. If you do make a donation, and are undecided about how you would like your contribution used, please specify the General Fund. You can also make contributions by sending a check to Ocracoke Preservation Society, P.O. Box 1240, Ocracoke, NC 27960. Many thanks to all of our supporters. I mentioned this once recently -- some of our readers' comments are not being published. As one reader said, they're somewhere out in "comment limbo." I don't know why this is. I do receive an email for every comment made, but until recently I didn't realize that our readers don't always see them. So today I share with you some of the recent comments that never saw the light of a computer screen. And I apologize to any of our readers whose comments I have missed. In the future I'll keep an eye out for discrepancies between my emails and the comments on the blog. My comments on your comments are in brackets. Ocracoke's earliest settlers were pilots, men who guided sailing vessels through Ocracoke Inlet and across the shallow Pamlico Sound. By the nineteenth century most island men were seafaring, and worked on coastal schooners and other boats up and down the east coast. 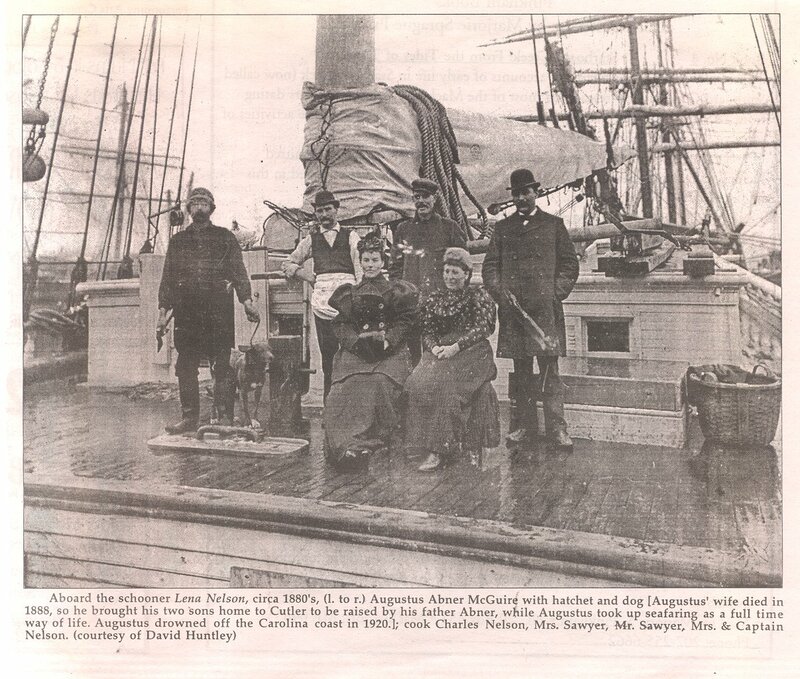 An Irish-American sailor & diver by the name of Augustus Abner McQuire also served on sailing vessels. He died at sea, and was buried far from home, on Ocracoke Island. McQuire is standing on the left in the photo below (click to view a larger image). Ocracoke Preservation Society recently had a monument erected where McQuire is buried, near the British Cemetery. Walk warily by his grave after dark. For many years islanders have reported seeing the ghost of "old diver" wandering about in that vicinity. 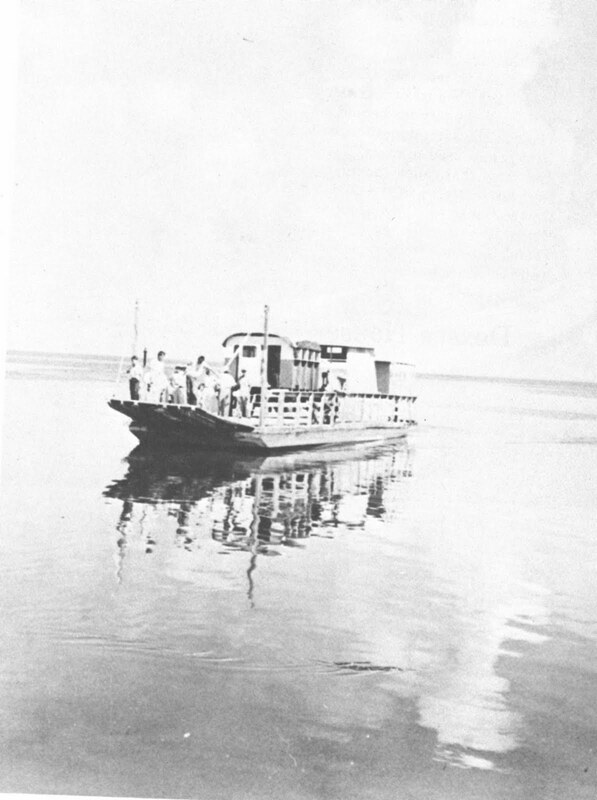 In the 1950s Hatteras native, Frazier Peele, started ferry service across Hatteras Inlet. His first venture simply involved nailing a deck across a wooden skiff. The next year he built a proper ferry with railings and a ramp. It held three or four vehicles, but he couldn't always get close enough to shore because of the shallow water. At those times his passengers would have to drive their cars and trucks through several inches of salt water in order to reach the sandy shore. As you can imagine, only the brave and adventuresome made the journey to Ocracoke in those days. But, my, how wonderful the island was back then! Click on the photo to view a larger image. 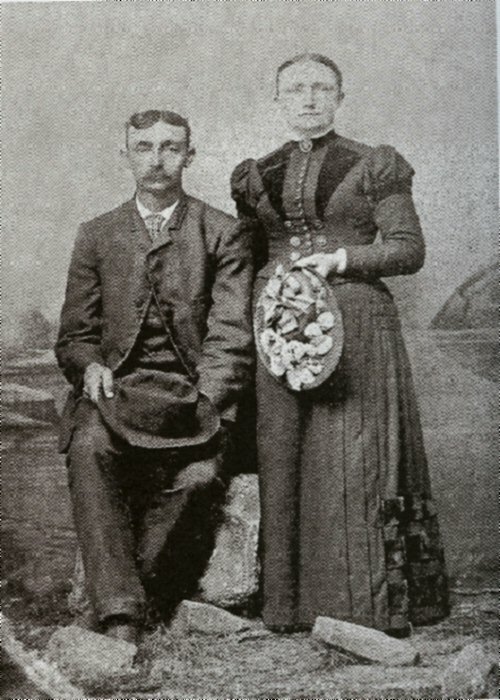 William Ellis & Fannie Howard lived where Dajio's restaurant is today. William's father, Enoch Ellis Howard, was the island lighthouse keeper. William died in 1933. Fannie died seven years later. During that interval she kept her casket in the parlor, propped up on two straight-backed chairs. Join us for our "Around Creek" Ghost & History Walking Tour during the summer months to hear the entire story. Established by the Taylor family, and later owned by Gary Bragg, the Pamlico Inn was last owned by Captain Bill and Miss Annie Gaskill. The Pamlico Inn sat on the waterfront, near the end of Lighthouse Road, facing Pamlico Sound. The Inn was a popular destination for hunters and fishermen. This photo was taken from a large platform at the end of the dock. In the summer island teenagers, young adults, and visitors congregated there every Saturday night for the weekly square dances. 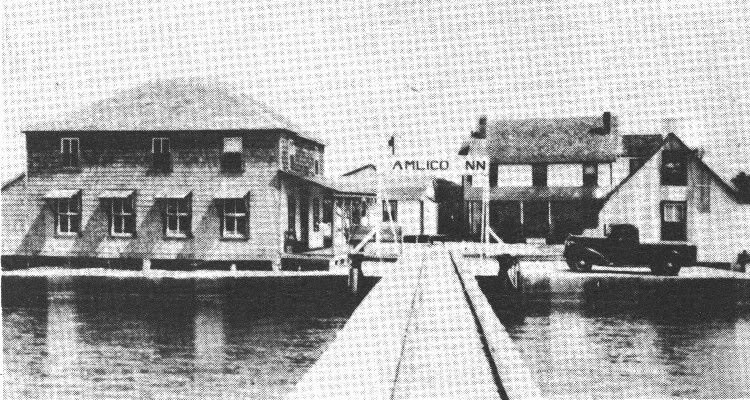 The Pamlico Inn was destroyed beyond repair in the 1944 hurricane. You can click on the photo to view a larger image. 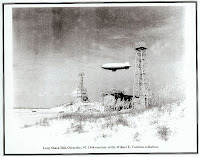 During World War II Ocracoke was home to a large naval base. Between 500 & 600 men were stationed here. The base was located where the Cedar Island & Swan Quarter ferry terminals and National Park Service Visitors Center are located today. The establishment of the base helped stop German U-boat attacks against US merchant vessels. The only remaining structure is the large circular cistern near the Visitors Center. 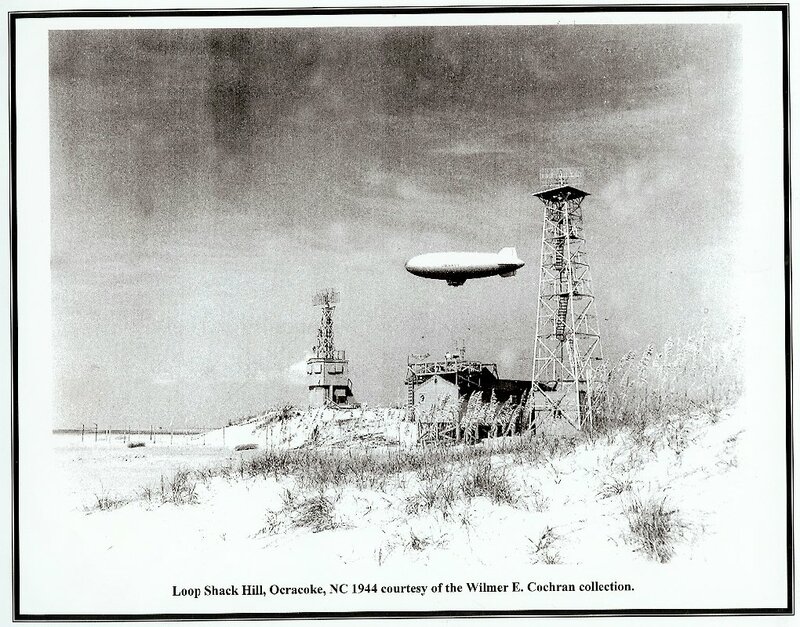 On the edge of what was then the "bald beach" (on what became known as Loop Shack Hill) the navy erected a radar tower, with communications buildings nearby. The base of the radar tower and a few other buildings still stand. You can reach them by stopping at the "Beach Jumpers" marker at the edge of town and climbing the hill. Be careful of the Prickly Pear cactus! You click on the above photo to view a larger image. Today's photo is from the late 1800s. This is the US Life Saving Station at Hatteras Inlet. 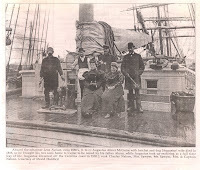 Captain James Howard, the first keeper (he served from 1883-1903) is on the right. His family is on the left. The station washed away in the mid 1950s. Today, all that is left are a few pilings on the ocean beach at the north end of Ocracoke Island. You can see them from the Hatteras ferry. I know how much our readers enjoy photographs, so I've decided to take this week to share one vintage Ocracoke photo each day. I won't add much commentary. I hope you enjoy this pictorial journey back in time. 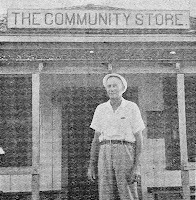 This is Amasa Fulcher, founder and owner of the Community Store. The store originally faced Cockle Creek (Silver Lake Harbor). A sandy foot path passed between the store and the water. The porch became a popular gathering place for island men who sat on benches whittling small birds, sharing jokes, and talking about the weather. I don't walk on the beach every day...but I do try to get out there several times each week, often 5 or 6 times. Dolphins are generally in evidence, especially in the winter, and if you've been reading this journal recently you know there have been a few whale sightings lately. Every now and then I find a whole seashell. The photo below shows a small collection of the highest quality shells I've found in the last year or two. I found the sand dollar a couple of days ago. I had walked south...and the tide was falling. Shortly after I turned around I noticed that this sand dollar had washed up right at the tide line. The shell at the bottom, near the center, is a small helmet shell -- one of the less common, but beautiful, univalves we occasionally find on our beach. The dark item near the top is not a seashell at all. It is a sea bean, a seed from a vine that grows along rivers and coasts. It's outer shell is thick and durable to keep seawater from penetrating. Sea beans sometimes drift for hundreds of miles before they wash up on shore. The other items are a starfish, two scotch bonnets (the NC state shell) in the middle, two lettered olives, and a small scallop shell. We've just published our latest monthly Ocracoke Newsletter, a list of traditional Ocracoke Island remedies collected from old timers by some of our school students several decades ago. You can read it here: http://www.villagecraftsmen.com/news032111.htm. There has been no decision by the NC DOT Ferry Division or the state legislature. However, a proposal has been made to charge $10 for one way passage at Hatteras Inlet...or $100 for a monthly pass. As our readers might imagine, there is widespread opposition to this plan among Ocracoke islanders. Speakers cited many issues, including impact on tourism, impact on island residents, and impact on tax revenue generated by Ocracoke Island businesses. Efforts are under way to partner with surrounding counties, and to communicate islanders' concerns to the legislature. We will keep our readers updated as more information becomes available. 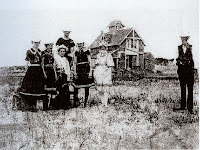 Our latest Ocracoke Newsletter is the story of a 1911 wedding on Portsmouth Island. You can read it here: http://www.villagecraftsmen.com/news022111.htm. Spring is definitely in the air. Temperatures have been in the 60s, and the forecast is for low 70s by the weekend. Flowers are blooming all over the village. Neighbors are out riding bikes, gardening, walking, and visiting friends. And visitors are returning to the island. And...Village Craftsmen is open for the 2011 season! Our spring hours (until Easter) are 10 am - 5 pm, Tuesday - Saturday, and 10 am - 2 pm, Sunday. Closed Monday. If you are on the island please stop by and say hello. As usual, we are adding new merchandise for the coming season. Come in and take a look. We'd love to see you. After reading Monday's post about Howard Street at night, one of our readers, Barbara, sent me the photo below. She took the picture during the Christmas season, 2008. Click on the photo to view a larger image...then leave a comment with your idea about what the image is in the lower center. And be sure to take a stroll down Howard Street after dark sometime! Become a Molasses Creek Tour Sponsor and Your Rewards Will Be Endless! Well perhaps not endless (unless your are referring to a general sense of well-being that will stay with you the rest of your life). But by becoming a tour sponsor YOU WILL BE THE FIRST TO RECEIVE THE HOT NEW MOLASSES CREEK RELEASE, CATHARSIS, AUTOGRAPHED WITH MANY THANKS BY THE BAND, and sent to your doorstep at the beginning of June. For the mere $30 you will also have your name listed on our tour sponsor page on the website, and will be able to proudly point out to your friends that you helped pay for those new van tires that took Molasses Creek to 15 performances from North Carolina to Maryland, Buffalo to Albany, Vermont to Boston, and back! Thank you! Thank You! Click here (or on the funny little van above) to find out more about sponsorship! Most of our readers have had the pleasure of strolling down Howard Street. The ancient live oaks, century old homes, and family graveyards that line the unpaved lane provide a glimpse of island life in days gone by. I often walk down Howard Street after nightfall. About a week ago it was so dark that I could barely see where I was going. More than once I walked into the bushes alongside the road...but I was able to stay out of the graveyards! With a waxing moon, as we have right now, a nighttime walk on Howard Street becomes surreal. The soft, diffuse moonlight filters through the tree branches, while shadows from the live oaks dapple the sandy lane and the cemetery fences. Just one more simple pleasure for us who live on Howard Street. Try it yourself; just keep an eye out for ghosts! I baked a buttermilk pie last night, and carried a couple of slices across the lane to give to cousin Blanche. Of course, sitting and chatting was more important than the pie. In time the conversation turned to the Civil War. Blanche reminded me that three Ocracoke schooners were in Charleston harbor when Confederates opened fire on Fort Sumter. One vessel, the Paragon, was under the command of Blanche's great grandfather, Horatio Williams. There is a wonderful story of how Captain Williams slipped out of the harbor under cover of dark, fog, and rain...and how he sank his boat to keep it out of the hands of the north...and the south. Look for the full story in an upcoming Ocracoke Newsletter. Another schooner, the Star, was captained by Blanche's grandfather, Perry Coleman Howard, and owned by his brother, Abner Bennett Howard. Blanche was distressed that she couldn't remember the name of the third vessel. "I can't understand why you can't remember the name of the third schooner," I said, furrowing my brow at Blanche. "It only happened one hundred and fifty years ago!" Several of us were chatting with an experienced wooden ship builder yesterday, hoping we might have an opportunity some day to work with him. With plans laid out on the table, we were discussing our carpentry experience. He related an anecdote. It seems another shipwright was assembling a volunteer crew to build a wooden sailing vessel. An experienced house carpenter came by to offer his assistance. The carpenter was well respected for his fine work, and had built a number of local houses. One of the first things the carpenter did was pull out his framing square. The shipwright looked at the square, then at the carpenter, and said, "Son, I don't think we'll be able to use you." Visitors to Ocracoke may like to know that the Ocracoke campground is scheduled to open on April 1, and will stay open through Halloween. This afternoon, Friday, March 11 @1:30pm at the Ocracoke Community Center. The indoor portion of the class should last around 1 1/2 hr. After the indoor portion of the class, we will move to several spots on the island for demonstrations of what we have learned. This is a free class brought to you by the N.C. Agricultural Extension Agency. Mac Gibbs, the Extension Agent for Hyde County, will be teaching the class and will be available for questions or visits after the class. Presentations to be held Monday, March 14th, 7:30 pm at the Fessenden Center in Buxton and Tuesday, March 15th, 7:30 pm at the Ocracoke Community Center. The National Park Service Outer Banks Group Know Your Park citizen science program series continues with presentations from nautical archaeologist Dr. Nathan Richards and education specialist/researcher John McCord. These programs are free and will last approximately 1 hour. The presentations will focus on the recent research and filming of German U-boats and Allied and merchant vessels sunk during WWII off of the Outer Banks. In addition to locating and documenting these shipwrecks, the Battle of the Atlantic research team has been collecting data on the fish and other marine life that live on the reefs now growing on the sunken vessels. Using a super high-resolution video camera, the research team shot digital video of a variety of these shipwreck sites on dives ranging from 80 to 250 feet. The video was recorded in 4096x2048-pixel resolution—about four times better than the best high definition television picture—giving the researchers an incredibly clear view of the details of the shipwrecks and the abundant marine inhabitants. In 1942, the Germans aimed to sink U.S. merchant ships that were carrying supplies to England. U.S. and Royal Navy ships patrolled the coast to protect them and, when necessary, take on the Germans. One of the most overlooked engagements of World War II, this battle claimed 80 ships and hundreds of lives. 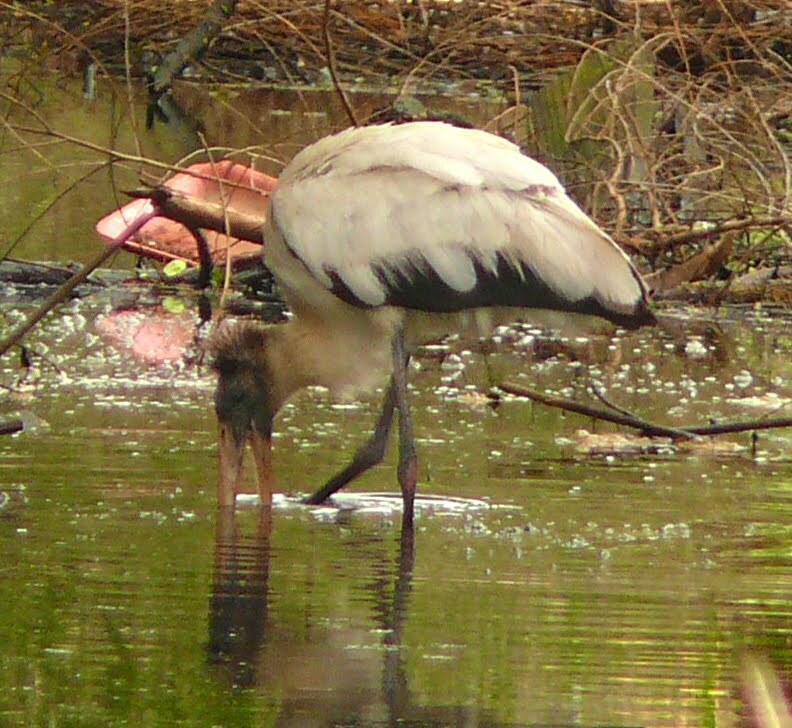 I just learned that a bird that is considered very rare this far north was spotted on Ocracoke recently. 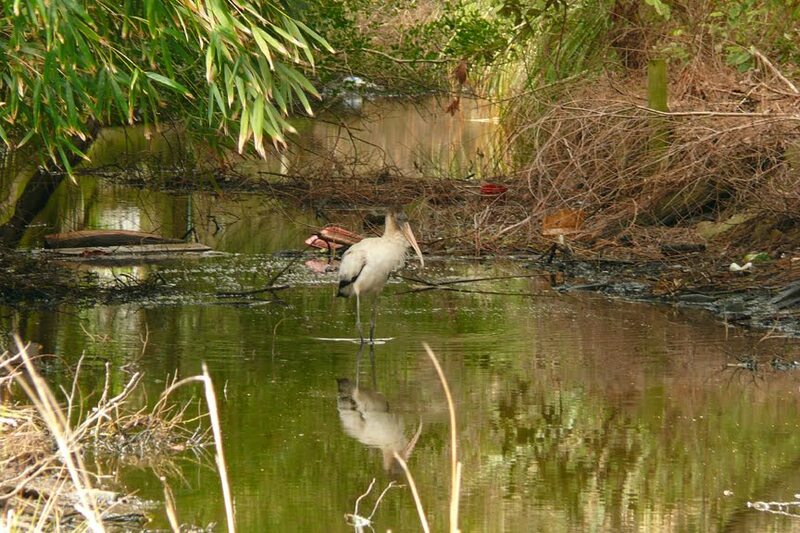 Carol Pahl noticed the wood stork on Monday, and made the photos below. She heard that Mark Justice has also seen the bird, and that it has been here a couple of days. I'm not sure when the last sighting of this species may have been, but Carol told me she heard that old time islanders used to eat them. That doesn't surprise me. 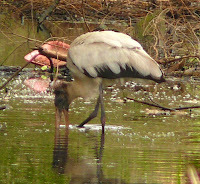 Old timers ate ducks, geese, beach birds, and even song birds. When you live on a tiny barrier island, and you're hungry, those birds look tasty! 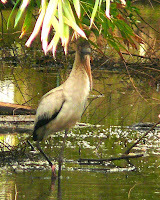 The wood stork is a big bird - about 40" tall and with a wingspan of 61" Carol points out that this is a juvenile probably a bit over a year old. 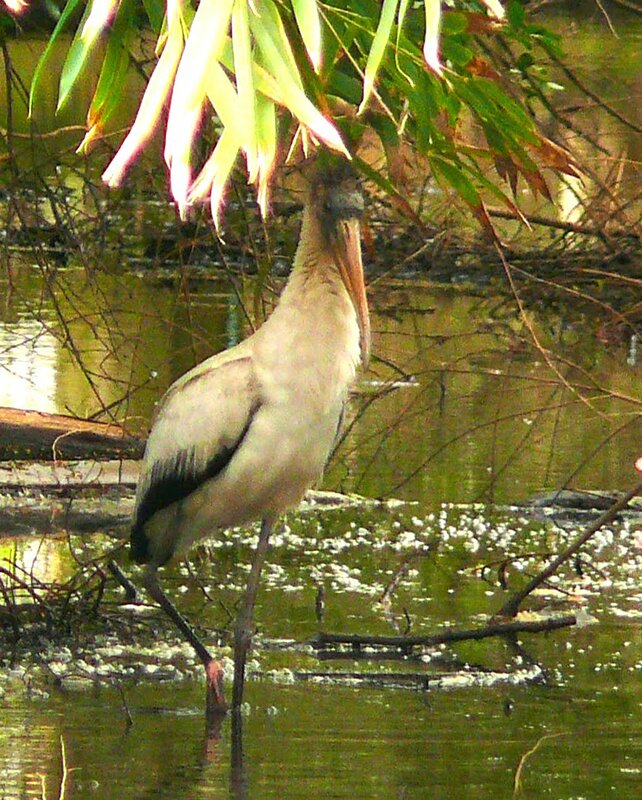 When they are fully adult they loose all their orange coloration and have a black head and neck. You can click on any photo to see a larger image (I think the curious cat had better be careful!). The Methodist Church Youth Group sponsored a fundraiser yesterday evening -- a pancake supper (yesterday was Fat Tuesday, after all). The church rec hall was packed with people enjoying their pancakes at tables, and on benches along the walls. Amy and I decided to carry our supper home (Dave stayed with Lachlan and other friends)...and along the way we invited a few other folks to join us. Dave Frum was among those who brought their pancakes to my house. After eating we adjourned into the living room so we could sit around the fire and chat (the temperature was in the 40s outside). At a quarter past seven Dave reminded us that the space shuttle and the space station would be passing over us in just a few minutes. Donning jackets and hats we walked into my front yard. Only a sliver of the moon...and a myriad of stars...greeted us. The night sky was simply spectacular. We marveled at the age of the universe...and the vast distances we could only barely imagine. Dave reminded us that some of the stars shining brightly above us had long since died out. We were literally looking into the past. Just then Dave pointed up toward the north. "Here comes the shuttle." Sure enough a bright dot was moving swiftly above us, traveling at 17,000 mph. We stood transfixed. Two minutes later the space station came into view, following the shuttle. For a short while both the shuttle and the space station moved across the sky, then disappeared within the shadow of the earth. It is all so marvelous...the universe itself, a mystery so deep we can only stand in awe...and the accomplishments of our species, an incredible feat so remarkable that we are able to contemplate and begin to explore the cosmos. And what better place to contemplate the night sky than Ocracoke! The cover story in my latest issue of Newsweek is an article titled "I Can't Think!" It is about information overload, and how too many choices sometimes result in decisions that make "less and less sense." Decisions become harder if the amount of information you have to juggle is great, and that can result in a "total failure to decide." While reading the article I thought, I understand perfectly. When I go to the grocery store with Lou Ann in her small midwestern town I am overwhelmed in the orange juice section (to give just one illustration). Several brands are for sale. Each one has orange juice in glass bottles, plastic jugs, & cardboard containers. There's regular size, family size, and lunch box size. Some are from concentrate...others are not. I can choose from no pulp, some pulp, or lots of pulp. Some varieties have calcium added...others have vitamin D. Some have both. Then there are varieties with citric acid...or ascorbic acid...or Omega-3 fatty acids...or battery acid (just checking to see if you're still reading). The article reminded me that I was out of orange juice, so I put the magazine down, got on my bike and rode down to the Community Store. The decision was easy. I bought the one and only variety in the cooler -- 59 fluid ounces of 100% pure & natural orange juice, no pulp. It was delicious. I never did finish the article. I was getting a brain freeze from too much information. Spring seemed to be here yesterday. The temperature climbed up to 60 degrees, with rain most of the afternoon. I used the rain as an excuse to stay indoors and catch up on much needed cleaning...and a little reading. Flowers, especially daffodils, are bursting forth all over the village. The tulips are poking their leaves up also. But spring is fickle. My heat pump came on last night, and I awoke to temperatures only in the low forties. Nevertheless, as Molasses Creek sings, "the back of the winter is broken, and light lingers long at the door." Seems back in the old days there was a preacher who’d never done any sailing but he’d been around a lot of sailors and he couldn’t understand why they were always cussing, particularly the captains. Well, it seems this preacher was given a trip on a schooner one day. As the preacher came aboard, the captain was using some pretty strong language to his men. “You shouldn’t talk like that to your men," the preacher told the captain. "Cussin’ doesn’t do any good." The captain nodded. The preacher went below. The captain called his men to him. He told them, "I’ve got a little plan for when the preacher comes back. When I say to you, 'My good men, take in the topsail.’You sit still. Don’t pay any attention." Well, when the preacher appeared, the captain said in a calm voice, “My good men, take in the topsail.” The crew paid no attention. Three times he repeated the order in the same words. And three times he was ignored. Finally, he screamed. “Blast you @#%^&, take in the topsail!” The crew jumped to his order. 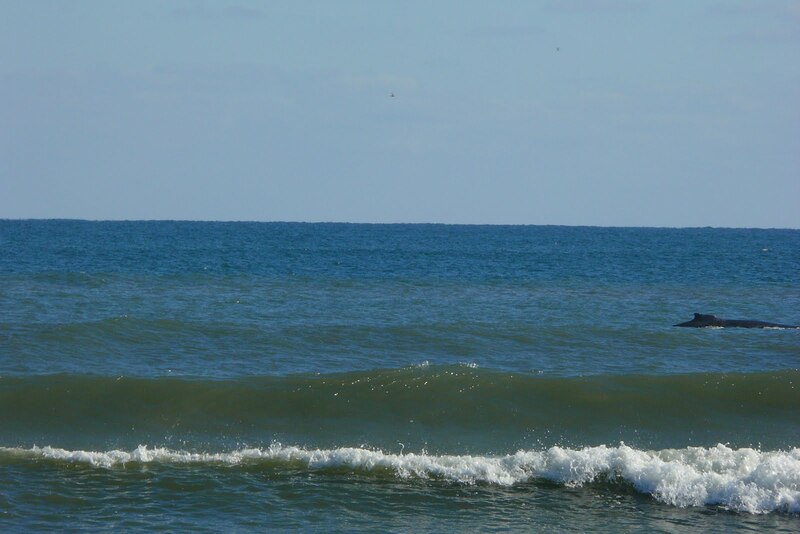 After hearing about my posts of the recent whale sightings on Ocracoke, Carol Pahl sent me two photographs she took last year when a whale graced us by spending nearly two hours swimming back and forth off shore of the "lifeguard beach." Carol says, "Neither really shows the excitement or size very well. I just couldn't get them to cooperate with me!" Click on either photo to view a larger image. Many of our readers will remember Emily & Andrew, accomplished musicians who come to Ocracoke periodically. As a duo they go by the name "Mandolin Orange." They will be returning to the Ocracoke Community this evening for performances for the students of Ocracoke School and a 7:30 PM evening concert at Deepwater Theater. Audience favorites from the Ocrafolk Festival, Mandolin Orange is a duo driven by Andrew Marlin and Emily Frantz, with songwriting & vocal harmonies at the core. The duo ornaments lyrical tunes both tender and tough with acoustic & electric guitars, fiddle, and of course mandolin. Their debut album "Quiet Little Room" was released May 1 to critical acclaim, and reflects the influence of traditional music on the duo's contemporary folk style. Take a listen at http://www.myspace.com/mandolinorange. Tuesday was the official release date for Tales from a Free-Range Childhood, the latest book by island resident Donald Davis. Donald's book has been selected as a 2011 "Spring Okra Pick" from Southern Independent Booksellers Alliance in the nonfiction category. The Okra Picks are titles that SIBA chooses each season which it considers ”great southern books, fresh off the vine." Donald Davis has been a nationally renowned storyteller for more than 20 years. He performs at festivals, conventions, schools, and other gatherings throughout the nation, and we always feel honored when he adds his wit, wisdom, and humor to events on Ocracoke. ForeWord Reviews has called Tales from a Free-Range Childhood "a seamless transition from oration to the written word." The first of many book signings will be held right here on Ocracoke Island, April 1, 7 pm, at Books to be Red on School Road. Other book signings are listed here: http://www.blairpub.com/events.html#davis. Ocracoke has musicians...rock musicians, folk & roots musicians, and classical musicians. Did you know we also have a jazz ensemble? Tonight at 7 o'clock at Gaffer's Sports Pub on NC Highway 12 our island jazz group will be entertaining diners for two hours with an assortment of blues, ragtime, and Dixieland music. You just never know what wintertime fun islanders will think up! Come on out for an entertaining evening. "These once bountiful, playful, and intelligent creatures have been hunted to the point of extinction. There are only an estimated 300 northern right whales left, and in spite of international laws that protect them, it is uncertain whether they can recover." 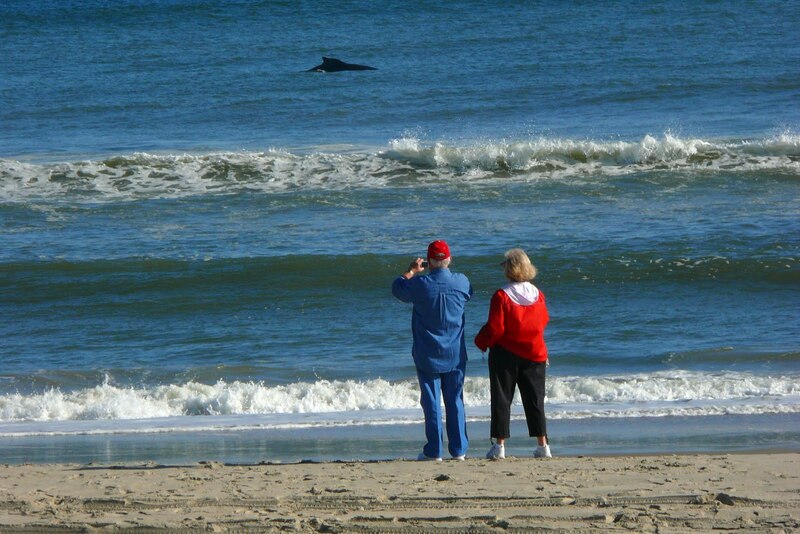 This winter there have been more whale sightings than I can ever remember from Ocracoke's beach. Perhaps these wonderful animals have made a comeback in the sixteen years since Pat wrote her book. We can only hope.